Five riders left the 108 Coffee House on Lemon Quay on a cold and windy morning. The Idless Valley offered some shelter from the wind until we crossed the A30 near Zelah . We then felt the full force of a head wind as we turned for St Newlyn East via Fiddlers Green . Onward through Cubert and Crantock until we reached the shelter of The C Bay Cafe for a photo shoot before we went inside. Hannah and Paul joined us from their new abode at Zelah and Jonathan returned home . Cakes ,scrambled eggs or bacon butties and coffee were devoured before setting off back for home with the pleasure of the wind to our rears. 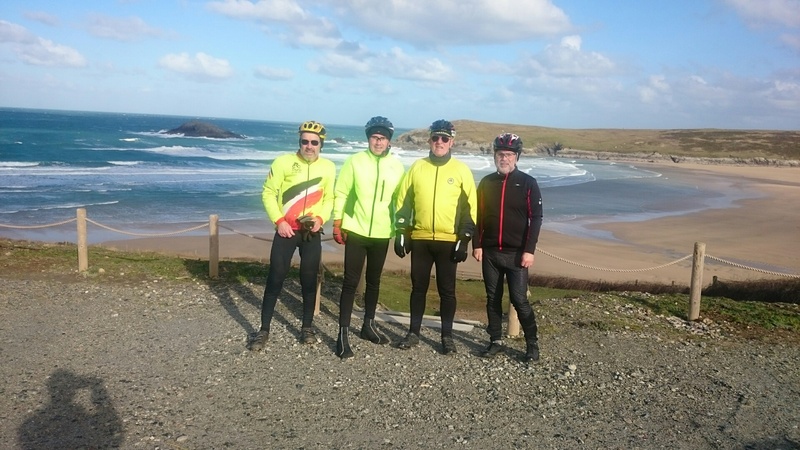 Nigel left us at Crantock to find his way back to Redruth via Perranporth and Hannah and Paul said goodbye near St Newlyn East and headed for Zelah. John and Chris went on to Mitchell and Ladock where Chris went his own way to do some extra miles. John returned to Tresillian. Riders :- John Flowers Leader, Chris Fearnley, Nigel Andrews ,Ian Cook, Jonathan Angilley, Paul and Hannah Charlesworth. Distance 33.7 miles average speed 10.8 mph. headwind up to 25mph.